Located in central Pennsylvania, Hersheypark first opened in 1907 as a way to attract visitors familiar with the popular confectioner's brand name. Today, thousands of visitors enter the gates each day to try some of the park's more than 60 attractions and shows. There are also other chocolate-themed attractions near the amusement park making the Hershey, Pennsylvania destination a dessert pilgrimage for chocoholics everywhere. Different types of chocolate may provide a wild ride for the taste buds, but amusement park guests interested in a real wild ride will want to visit some of the park's exciting rides. 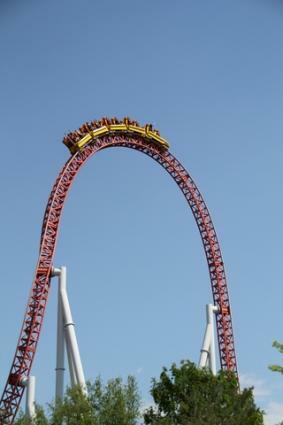 Hersheypark features 12 roller coasters, 14 water rides and 30 family-friendly rides. In addition, the park offers more than 20 kiddie rides scattered throughout the park for younger guests to enjoy, as well as classic amusement park rides such as a Ferris wheel, carousel, and a Tilt-a-Whirl. Comet: This wooden coaster takes riders on a high-thrill ride with lots of high speed turns and drops. Great Bear: This inverted coaster takes guests through four daring flips at speeds reaching 60 miles per hour while their legs dangle from ski-lift style seats. Coal Cracker: This classic flume ride offers a cooling plunge at nearly 40 miles per hour to create a tremendous splash sure to drench riders. Kissing Tower: This iconic observation tower has Hershey kiss shaped windows and offers an unparalleled view of the park from 25 stories up. Lightning Racer: This twin wooden roller coaster alternately duels and races as it reaches speeds higher than 50 miles per hour. Waverider: This head-to-head surfing competition machine is in the park's Boardwalk section, home to many splashy water rides. Storm Runner: This intense launch coaster thrusts riders to 75 miles per hour in just a few seconds as they run to conquer three unique inversions. Roller Soaker: This water ride features water squirt guns, water sprayers, and spurting geysers. Not only do riders get wet on this ride but viewers may also get drenched by riders dumping buckets. Balloon Flite: This ride gives children a ride on a pretend hot air balloon. It is a moderate-speed ride sure to be a hit for kids of all ages. 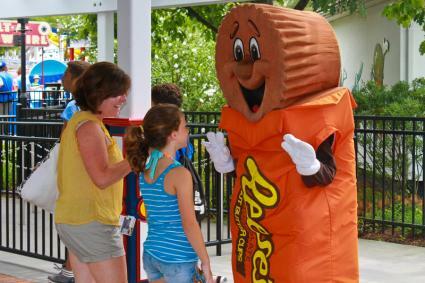 When guests are ready for a break from the park's thrilling rides, they can take in some of the spectacular shows, including five regular showcases and meeting costumed Hershey product characters. Fireworks light up the sky nearly every Saturday evening. Don't leave the park without a visit to the Aquatheatre. This is a great place to relax while watching the sea-lions. Guests at Hersheypark can enjoy a wide selection of food options. You can find anything from dessert treats to classic amusement park fare such as pizza, burgers, and hot dogs, Guests can also find many healthier options. Smoothies, egg rolls, kettle corn, wraps and salads are all available as well as child-sized portions for younger guests. Those interested in the ultimate experience can take advantage dining with one of their favorite Hershey characters. Extra charges will apply for this option. Hersheypark is an amazing destination and offers guests many ticket options to suit their visitation requirements. The park is open seasonally from early May through the end of September, with special spring, Halloween, Thanksgiving, and Christmas events as well. There are several options for admission tickets to the park. You can choose from the following in-seas season options, though please note that pricing is approximate. Rates are updated each season and vary for special events. View the park's admission pricing page for current information. One-day admission: Single-day regular admission tickets are available for visitors ages 9-54 are around $50. Single-day admission is around $25 for juniors ages 3 to 8 and seniors 55 and over. (Children under three are admitted free). Two-day Admission: Two-day passes are available for around $75 for regular admission and around $60 for juniors and seniors. Three-day admission: Three-day passes are available for about $105 for regular admission and about $85 for juniors and seniors. Season tickets are also available for those ages three and up. Season passes are priced about $135. In addition to season tickets to Hersheypark, you can also take advantage of a combined ticket giving you admission to both Hersheypark and Dutch Wonderland. The discounted combination ticket is priced near $200. To learn more, visit the park's website, call 1-800-HERSHEY, or email info@hersheypa.com. Hershey's Chocolate World: This interactive destination includes a factory tour and allows visitors to make their own personalized chocolate treats and purchase all types of Hershey souvenirs and memorabilia. The Hershey Museum: This educational attraction includes the Kisstory exhibit about the iconic Hershey's kiss treat, as well as Hershey family history and other interactive displays. The Chocolate Spa: There is no better way to indulge in a chocolate fantasy than with a whipped cocoa bath, chocolate sugar scrub, fondue wrap, or cocoa massage. 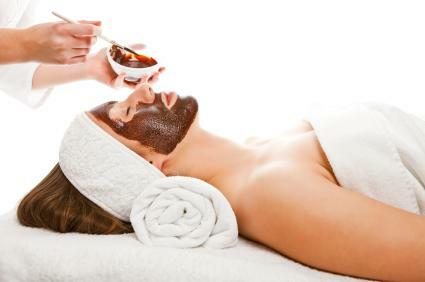 These and other chocolate-themed treatments are available at this elite spa at the Hotel Hershey. For more information about these and other attractions in Hershey, visit HersheyPA.com. Whether you are planning a weekend visit to the family-friendly amusement park or you have a week's worth of vacation to burn, consider staying at the following popular hotels located close to the park. Located just a mile-and-a-half from Hersheypark, Hampton Inn & Suites offer visitors comfort and convenience. The 110-room hotel is situated on Chocolate Avenue, just a stone's throw from the popular theme park. Getting to the park is a breeze, as is taking advantage of the hotel's amenities, which include a complimentary breakfast, fitness center, valet service and free high-speed wireless internet. If you are traveling on a budget, but still want a clean and comfortable place to spend the night while visiting the park, then consider reserving a room at the Comfort Inn at the Park. Located just two miles from the sweet smelling theme park, Comfort Inn offers guests a variety of amenities for an affordable price. Highlights include free breakfast, free newspaper, room gaming systems, heated indoor pool and a business center. Days Inn Hershey is the closest lodging to Hersheypark. Situated less than a mile from the theme park's entrance, you can't beat Days Inn for its price and proximity to all things Hershey. The kid-friendly amusement park is so close to the hotel that you can see some of the attractions from the lodging's parking lot. Walking to the park is an option if you stay at the Days Inn Hershey. However, if you don't feel up to the stroll, then you can take the hotel's free shuttle bus. If you are looking to vacation in style and still remain relatively close to the park, then consider booking a room at Bluegreen's The Suites at Hershey. The upscale lodging features all the comforts of home, including spacious two-bedroom suites that come equipped with full kitchens and a host of other amenities. The Suites at Hershey also boast a heated outdoor pool and hot tub where you can sniff the chocolate-scented air that lingers around town. Kids will also have a blast in the hotel's outdoor playground and indoor arcade while adults can burn off some of their sweet indulgences at The Suites' fitness center. Local hotels in and around the park often offer money-saving travel packages, especially during the height of the park's busy summer season, which runs from May through September, as well as during fall and winter special events at the park. . Features and prices are subject to change, but you can expect at least a 10 to 40 percent savings when you opt for the package than if you were to purchase each of the features individually. Hershey Lodge also offers several seasonal travel packages for frugal travelers who want to pay one price for a host of services and amenities. The full-service resort features 665 guest rooms and is a Mecca for chocoholics. Halloween in Hershey: Some of the resort's most popular seasonal packages include the "Halloween in Hershey Package," which is offered each October. The discounted travel package features fun for the entire family. For one price you get accommodations, breakfast with Hershey's product characters, admission to the park and to other locations such as Hershey Gardens. Check with the hotel for current-season package details, rates and availability. Breakfast with Santa: The Lodge's "Breakfast with Santa Package" is offered during November and December. Kids of all ages can take advantage of super savings with the hotel's Christmas-themed package, which includes hotel accommodations, breakfast buffet with Santa, one-day admission to Christmas Candylane, and admission to Hershey Sweet Lights. Check with the hotel for current package information, pricing and availability. Hersheypark offers families a fun-filled vacation anytime of the year. Whether you like rides, shows or sweet treats, there is something for everyone to enjoy at this great destination.